Over the past couple of years, a collection of tunes developed among a trio of friends who intended nothing other than to express a love and enjoyment for music, never realizing the mounting buzz that they were about to face. There is an effervescent appeal to Foster The People. The music envelops an instantaneous burst of pleasant excitement, and yet contains an elusive intrigue that incorporates the deeper elements of each song's purpose, pulling in audiences from every direction. Though a relatively new group, Foster The People continue to execute accomplishments that have molded layer after layer of promise for the band. Torches, their first album's debut, is only now two weeks away, but it is most likely this is not the first you've heard of them, and certainly won't be the last. During a recent interview with frontman Mark Foster, he tells Baeble about the band's basic beginnings. "Mark (Pontius) and Cubbie are basically just friends of mine" he says simply. After hanging out with the two individually in Los Angeles, Foster quickly learned of their music experience and brought them together, leading to the creation of Foster The People. Initially, Mark tells us, Pontius and Cubbie Fink "didn't move to LA to pursue music, they moved here for film school". Thus, the birth of the band truly came from a labor of love with no other motive than to play music for the sake of exploring a genuine passion. Due to the undercurrent of this heart that the band possesses, things have rapidly grown into a truly exciting direction. As the band began to think seriously about their purpose, things really fell into place surrounding the accidental, yet equally impactful, meaning of their name. "Originally we were talking about having Foster And The People". But a fateful night in a noisy club altered things, as Mark Foster tells us a story about meeting a friend of his while watching a show and telling him about his new band, Foster And The People. "It was loud and there and he's like, 'Oh, it's Foster The People? That's awesome!' And I was like, 'No, no, it's Foster AND The People'". After the correction, his friend's face fell, and Mark realized that "Foster The People. That means something totally different". This suddenly tied into another aspect of the group that represented a deeper drive they were intent on pursuing. "Early on, we played some charities, kind of our first shows", citing a Toms Shoes 'Day Without Shoes' event as one of these endeavors, "and that was kind of right around the same time that we were discussing our band name". As Mark explains, these events came about "when we were starting the band", which spurred greater action as they began to "talk a lot about wanting to just be involved and help people in other ways rather than just making music". The term Foster The People instantly fell into place surrounding these discussions, as they all expressed a desire to "just be of service to people". It became a serendipitous label for the trio, coinciding perfectly with the misconception of their original name idea, since this charitable nature "was already kind of in our heart", Mark says. When asked about their influences, it is instantly evident where their laid back and encouragingly loveable groove has found its footing. "The Beach Boys are probably the most influential band", says Foster. "I was listening to them when I was a little kid, and so it's embedded in my musical brain. There's no way to get away from that". It's a good thing too, since this definite taste of The Beach Boys is clearly an active element of Foster The People's reception. They too pack a delivery that is easy to love and hard to hate, with their propelling and infectious beats that are cleverly contrasted with a calming ease and unique burst of energy that is as bright as it appears effortless. The proof is not only in the music, but most tangibly within fans' reactions. "We just have fun when we're on stage", Mark states, exemplifying the optimistic nature behind their attraction. "We're not trying to go up there and put on a front and try to be these rock gods that are bigger than life. We're just up there having fun playing music and I think that's translated all around at every show we've done". They're certainly grateful for the resulting connection fans have developped from this endearing attitude. "People are just so happy. When we get off the stage, I just get hugged left and right", Foster marvels. They can't seem to help the dual appreciation that exists between them and their fans, and as Mark wisely puts it, "It'd be weird if our band name was Foster The People and we were assholes". One recent milestone for the band came about last month when they performed at Coachella and felt the impact of their success, in perhaps the biggest rush of realization up to that moment. "Coachella was just incredible. Walking onto a stage and looking out and not being able to see the end of a crowd..." Foster loses his words at the memory. "It's mind blowing. You can't really describe what that feels like. We closed our set with 'Pumped Up Kicks' and everybody just erupted. They were engaged the whole time, which was surprising to me, through songs that nobody's ever heard before. And that was cool, but then playing songs that they have heard before and to hear thousands of people sing 'Pumped Up Kicks' back at me; it's..." once again, the enormity of the experience overwhelms him. "There's really no words to describe it". As for the upcoming album, Foster finds that the actual recording process "brings so much more life to the tracks". The complied result "is pretty versatile. The songs that are on the record tend to have a hopeful, upbeat, or joyful sound to them, but I think in conjunction with 'Pumped Up Kicks', lyrically, there's an undercurrent that kind of goes against the grain of the feeling of the music. I like to do that a lot. I think through every problem that you have in your life, whatever emotional thing you could be going through, there's hope at the end of it. The music represents that never-ceasing hope that things can change, but the lyrics are digging more into the darkness of the situation". While they initially experienced their first success in Australia, the release of their debut album, Torches will call for exploring other areas of the world that have now grabbed hold of the group. "There is a special place in our heart for Australia", says Foster, but over the next couple of weeks they will be "doing some shows around Europe. And then we come back here and do Jimmy Kimmel". This apperance will be on May 23rd, the night before their album release. "And then we go back out on our second US tour. We're playing a bunch of festivals this year. We're going to be probably touring the US two or three more times this year and also bouncing back from here to Europe to Australia", bringing the group full circle. The success that Foster The People have garnered, born from their pure-of-heart passion and talent, is not something that will be ceasing soon. "We're going to play music for the rest of our lives", Mark says. "We've been playing music our whole lives and we're going to keep playing music. I think our goal for Foster The People is just to keep pushing forward. It really is such a blessing to be able to be creative", he states with gratitude, then adds with a laugh, "and not have to deliver pizzas anymore". 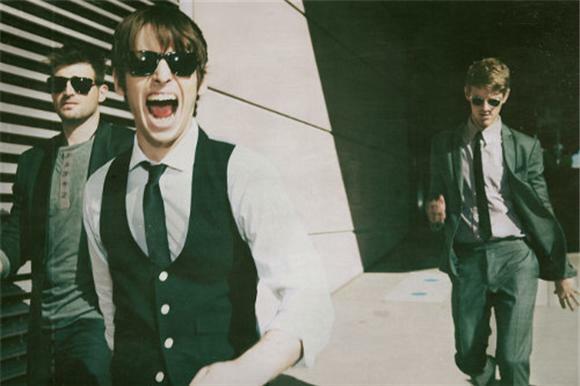 Foster The People are currently offering a few remixes of their singles "Pumped Up Kicks", "Houdini", and "Helena Beat" in anticipation for the release of their debut album, Torches, which drops after much anticipation on May 24th.